We are into the first week of March already! Even though everything is covered with snow again along with some single digit temperatures on a few mornings, I keep telling myself that March is also when the calendar says spring arrives. Think spring! Yesterday daughters Elizabeth and Susan and their sweet little ones came to spend the day. Susan brought their buggy and horse and picked up Elizabeth. The little girls were bundled up but still had little cold red cheeks when we took off their coats. Son Joseph, 16, carried in all three children and then unhitched the horse and put him in the barn. I’m sure after the drive here my daughters were glad to have Joseph take over with the horse. How fun for Grandma to sit there and help take off their coats and see the smiling little faces. Even baby Timothy giggled for me. He is 11 weeks old and a little over 11 pounds now. I had not seen the girls and their little ones since Friday evening and that seems long for me. Friday evening Tim and Elizabeth brought in our supper. Mose and Susan also came with dessert. When Mose and Susan brought our meal, Elizabeth made the dessert for her as well. Our supper was meatballs, lasagna, dinner rolls and dirt pudding. 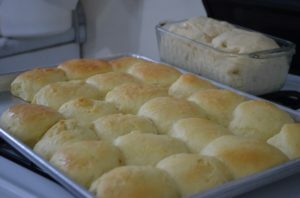 Elizabeth made the dinner rolls after she was here so they were warm from the oven when we ate. It was greatly appreciated. She left the leftovers here so we had another meal from it. Daughter Lovina, 14, and son Kevin, 13, left for school a half hour ago. I showered and washed my hair and decided to write this column as my hair dries. I plan to go with daughter Verena to her eye appointment. She went last week from a previous scratch in her eye causing problems again. Now it should be healed enough to test her vision. She had not had her eyes tested for almost four years. She wore glasses when she was younger. At one time we had our six oldest wearing glasses plus myself. There for awhile we were at the eye doctor a lot, with either a bent or broken frame. Joseph was good at losing his at school since he only needed them to read. Now Elizabeth is the only one besides me that still needs her glasses. I don’t miss having to worry about all their glasses. We also had to make sure we had different frames so no one would get mixed up which pair was theirs. Saturday evening Elizabeth and Tim had supper brought in to them from Elizabeth’s three friends and families. Those four friends are now all mothers and I’m sure their conversations are much different from when they were teenagers. It is so nice that they all get together yet. Abigail was glad to have little friends to play with. Sunday husband Joe, Kevin, and I were home alone with the rest all at different places. Son Benjamin, 19, was at Mose and Susan’s as they had some of Mose’s family there for the weekend. Daughters Verena, 21, and Lovina spent Saturday night and Sunday at my sisters Verena and Susan’s house. Sounds like they had a nice time there. Joseph went with Dustin and daughter Loretta, 18, to church which Dustin’s brother Clint and family were hosting at a neighbor’s place. Joe, Kevin and I played games, rested and did some reading. The day went pretty fast and I was glad for the extra naps. I want to apologize for a mistake in my last recipe, Tater Tot Skillet Casserole. It should have said 4 cups of tater tots, not 1 cup. I rushed and that is why they say haste makes waste. Hopefully most of you caught the mistake if you tried the recipe already. God bless! Add yeast and sugar to warm milk and let stand for 15 minutes. Stir in remaining ingredients. Stir well and let stand in warm place approximately 20 minutes until double in size. Form into 24 egg-sized rolls. Place on a well-greased cookie sheet. Bake at 375 degrees for 20 minutes. It is past time for me to get this column on its way. There’s so much that should be done, but a person can only do so much. One day at a time! We did manage to get our windows cleaned on Saturday. It doesn’t take long for them to get dirty, especially because of the rainy weather and running the coal stove. We haven’t had any heat in the house for several weeks now. On a few of the colder mornings, it would have felt good to have some! The propane lights heat up the house. We use a lot more battery lights on days that we don’t need heat. My husband Joe, our sons and son-in-law Mose have planted some garden. This is the first year I haven’t helped plant. I’m not complaining if I don’t need to help! But we will still have the big garden to plant, so I’ll get my chance. They planted red potatoes, onions, radishes, lettuce and cucumbers. I’m not sure if they have any corn planted yet. I need to go get more seeds so we can finish the planting. This week I have been busy sewing for the wedding next week. I have Loretta’s dress, cape and apron done. I hope to sew Verena’s today and hopefully I’ll get started on mine. I sewed Benjamin, 17, a pair of dress pants. He also needs work pants. Laundry needs to be done today, but I am waiting to see what the weather is going to be. It is very windy and the sun comes out a little bit and then it rains a little. We are enjoying asparagus from our garden. I like to fix it several different ways. Joe reminded me last night that we have rhubarb ready to use. I did get the hint that he’s hungry for rhubarb custard pie! Loretta, 16, and I are alone today. The rest of the family are either at work or at school. Joseph, 14, reminded me this morning that he only has thirty more days of school left. He is in eighth grade, so this will complete his school years. He signed up to help detassel corn this summer. Joseph is tall for his age, so he will find that helpful when he works in the corn fields. 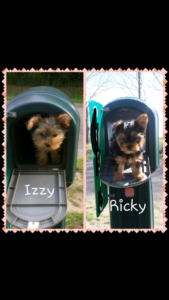 Posing in the mailboxes: Izzy has been Elizabeth’s Yorkie for many years, and puppy Ricky (also a Yorkie) has just joined the Eicher family as Verena’s special pet. Yesterday daughter Elizabeth and Abigail came for the day. Abigail is getting everywhere on her tummy. She scoots herself around, and so I need to keep my floors clean! Abigail is growing up with Yorkie dogs, so she wasn’t scared of Verena’s new little Yorkie, Ricky. Ricky is doing great and is doing well with the potty training. He likes to hide from us. His favorite place to hide is under Joe’s recliner, where he peeks out at us. Yesterday everyone was looking for him. A few decided to look outside, because he loves to slip out when someone goes through the door. I looked around the living room and bedroom. I happened to look back and he was following me. We are looking forward to meeting the readers in South Holland, Ill., this Saturday. Our good friend Ruth is once again doing so much for us. Since we live several hours from South Holland, she will come get us Friday evening and then we will stay at her house for the night and go to the book signing on Saturday. Joe, daughters Verena and Lovina and sons Joseph and Kevin are planning to go with me. Loretta and Dustin will go help up set wedding tables on Saturday for his brother Jake’s wedding. This will be at Jake’s girlfriend’s parent’s house, which is about one and one-half hours from here. Jake is the first of Dustin’s siblings to get married, so this will make a big change for their family. With all of us leaving, that will put son Benjamin in charge of doing the chores here at home. Mose and Susan will be here to help him. I’ll share Uncle Solomon’s horseradish recipe. Joe and I made some to serve with the colored eggs at Easter. Our horseradish plant is really big already. Clean and chop horseradish root very fine. Combine vinegar, water, sugar and pinch of salt, adding only enough horseradish to make it the thickness you like. Add more sugar or salt to taste. Store in sealed container and refrigerate or use immediately. 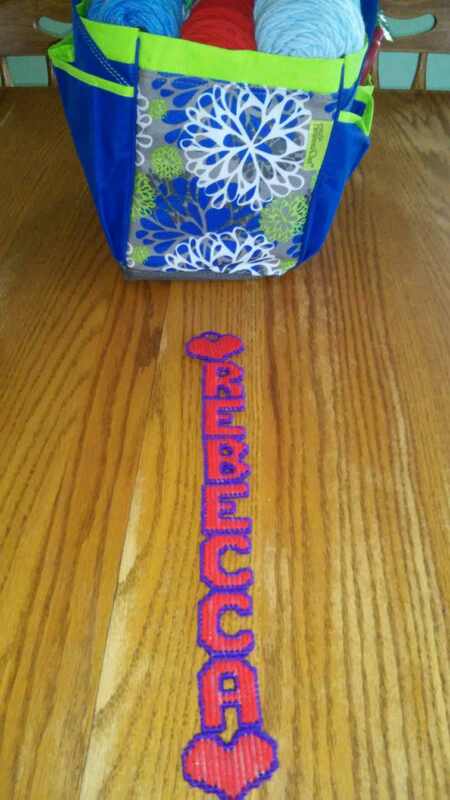 Daughter Lovina is enjoying making projects out of plastic mesh and yarn. Week after week goes by so fast! Christmas is only five weeks away from Sunday. Yesterday our children didn’t have school due to fog. At first they had a two-hour delay, but cancelled after the fog didn’t lift. We have phones in an out building in this community. The school always leaves us a voice mail if school is delayed or cancelled. This makes it so much easier than it was years ago if there was a delay. When we lived in Indiana we didn’t have a phone on the property. If there was a delay the girls would still get ready and just wait to see if the bus would come. It was always easy for them to entertain themselves but it would have been nice if they could have slept later on those mornings. We could use our neighbor’s phone if they were home but I didn’t want to leave the children alone to go call the school. Days like that always seemed short for me. Now it is 8:00 a.m. and daughter Elizabeth and granddaughter Abigail just arrived by buggy. Izzy also came along so she stays out of Crystal’s way. Crystal doesn’t let Izzy near her new puppies (see last week’s column). Izzy is nosy and tries to go as close as possible until Crystal chases her to the other end of the house. Daughter Susan is leaving soon to go to work until 2:00 p.m. She was glad she could hold Abigail a little before she leaves. She will take the buggy and our horse Mighty today. The campgrounds are around five miles from here. She does hire a driver to take her some days but then it gives her less income if she has to pay a driver. This job doesn’t pay nearly as well as the factory did, but then she isn’t as rushed at work either. Son Joseph, 14, went with son-in-law Mose deer hunting yesterday. His day off of school was enjoyable. They saw an eight-point buck come their way. Then something scared the buck off. Joseph was really hoping to get a shot at it. Maybe next time! Abigail’s smile just gets sweeter! She is full of smiles today. Elizabeth had her to the doctor last week for her two-month checkup. She weighed 12 pounds 3 ounces and is 23 3/4 inches long. I am excited about my new cookbook coming out next April. 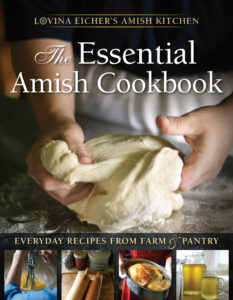 It is called The Essential Amish Cookbook: Everyday Recipes from Farm and Pantry. The publisher, Herald Press, comes up with the title. But my family spent a lot of time helping with this cookbook. This is the first cookbook I published without working with a co-author. I have had lots of great help from family and friends. The recipes were all tested since I often cook without measuring ingredients. 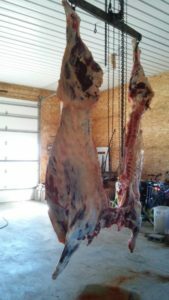 This will make it easier for those of you that don’t cook often and need exact measurements. I’ll share one of the recipes that will be in the book. This recipe will come in handy with leftover turkey after Thanksgiving dinner. It is supposed to be made the day before but if you make it in the morning it will work well also. We have a nice fall day with the temperature at fifty degrees and sunshine. Looks like the girls will wash laundry today. God bless! In a bowl, combine turkey, celery, green pepper, onion, mayonnaise, salt, and pepper. 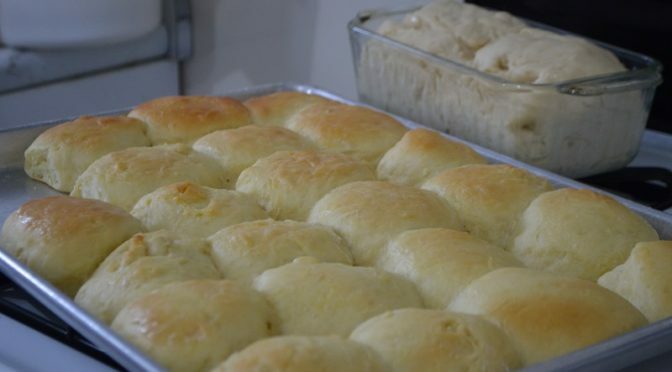 Cube the bread and place half in a large greased casserole dish or 9×13 inch baking pan. Pour turkey mixture over the top and add remaining bread cubes. In a bowl, mix milk, eggs, and cream of mushroom soup and pour over top of casserole. Let stand in refrigerator overnight. Top with cheese and bake uncovered at 350 degrees for one hour. Lovina Eicher is an Old Order Amish writer, cook, wife, and mother of eight. 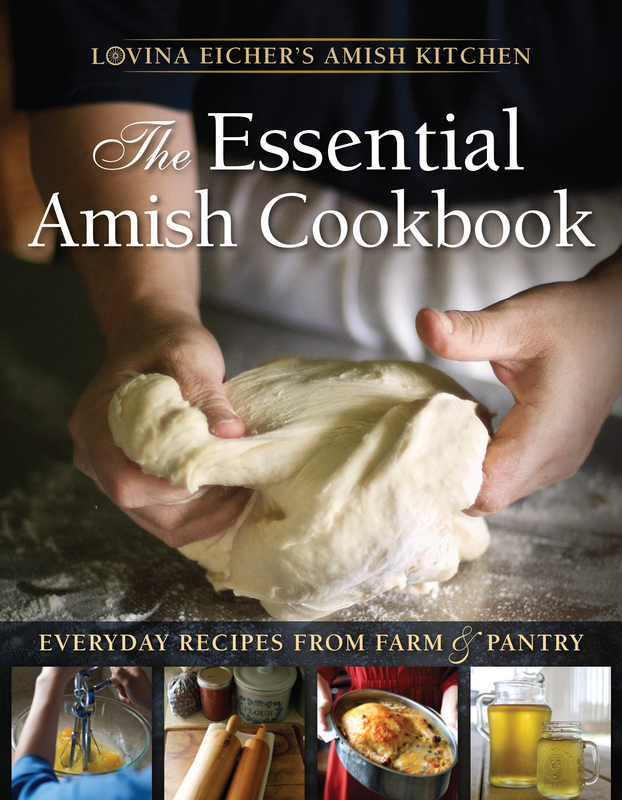 She is the co-author of three cookbooks; her new cookbook, The Essential Amish Kitchen will be published in 2017. Readers can contact Eicher at PO Box 1689, South Holland, IL 60473 (please include a self-addressed stamped envelope for a reply) or at LovinasAmishKitchen@MennoMedia.org.